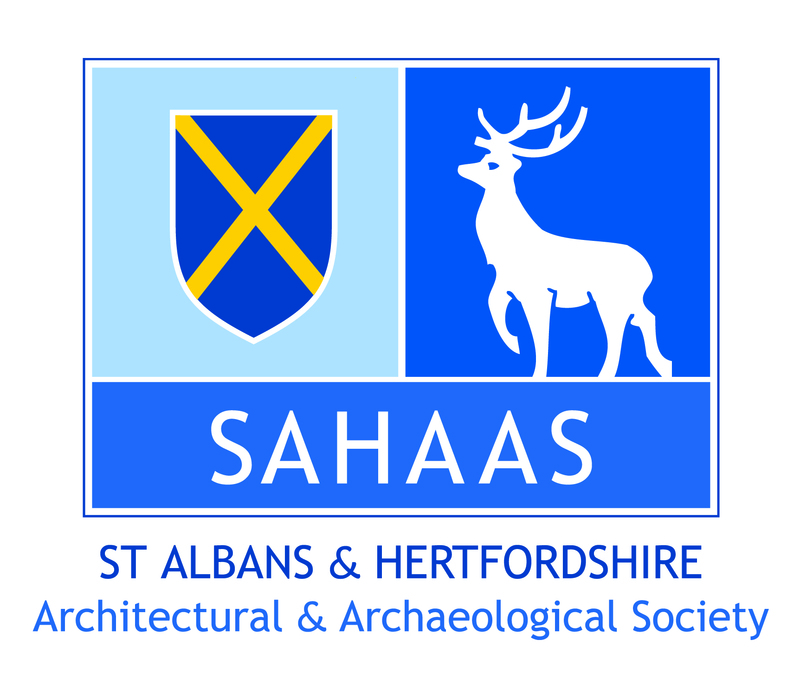 Thanks to Stuart Gray of Strutt and Parker, I was able to contact Pete and Fiona Letanka and obtain permission for us to survey the paddock of Darrowfield House which lies immediately behind Verulamium Museum. 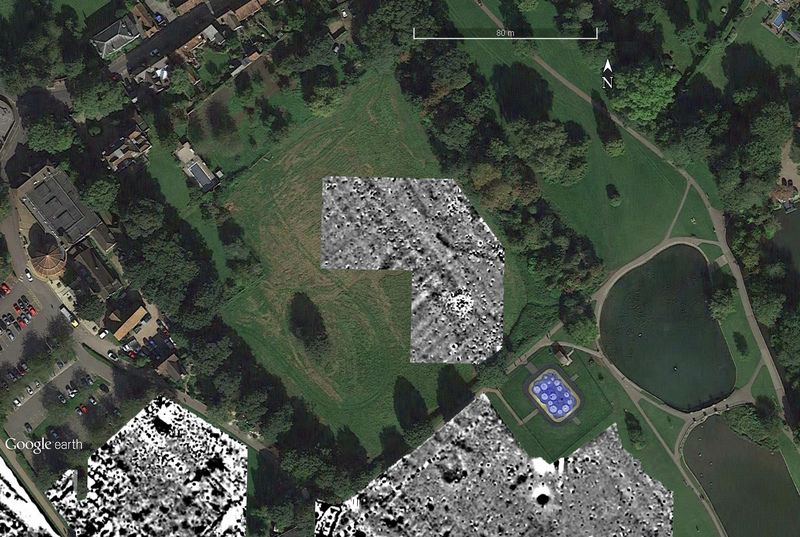 It is the last large-ish area of Verulamium left that has not been totally surveyed using magnetometry. 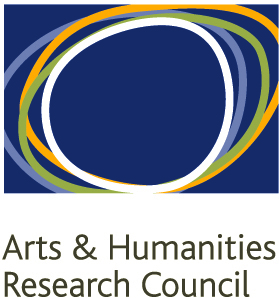 Members of CAGG are, therefore, spending this week filling in the gap. Our mag was away being repaired, but Pat Johnson of Foerster kindly agreed to bring it down to us today. 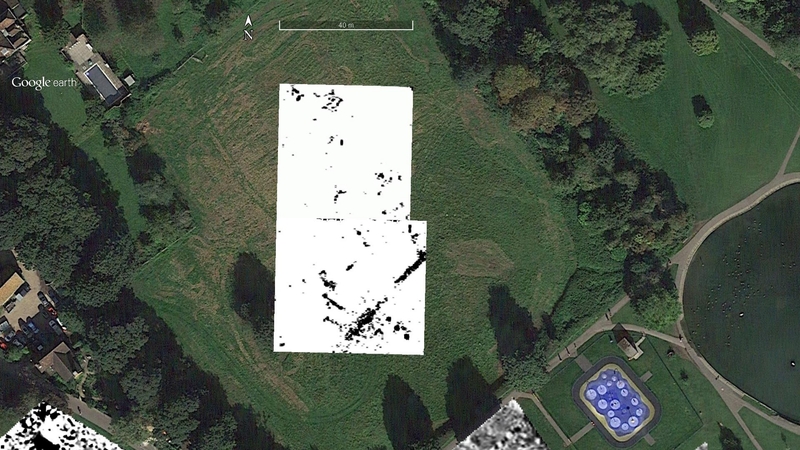 We started, therefore, with Earth Resistance and GPR, but after lunch the poor old res meter was left abandoned on the grass while the team got started with the mag survey. The paddock ought to be exciting. It lies just behind the line of the Roman wall, and there is a road shown in publications running SW-NE across it. The first mag results are shown in Fig. 1. Fig. 1: the mag survey. The GPR survey has been processed in 3ns thick slices. As usual, I’ll work my way down from the top. Fig. 2: GPR survey, time slice 3, from 10.5ns to 13.5ns. Fig. 3: GPR survey, time slice 4, from 13.5ns to 16.5ns. The third slice shown in Fig. 3 really shows surprisingly little. I’m guessing we are only looking into the topsoil here. The fourth slice (Fig. 3) starts to show some diagonal striping similar to what we can see in the mag data. Again, this is probably agricultural. Fig. 4: GPR survey, time slice 5, from 16.5ns to 19.5ns. Fig. 5: GPR survey, time slice 6, from 19.5ns to 22.5ns. The fifth slice (Fig. 4) shows the striping very strongly, with two alignments at right angles. I think these must be land drainage. They look too straight for “ridge and furrow” and do not have a headland. What is also interesting — or is that worrying? 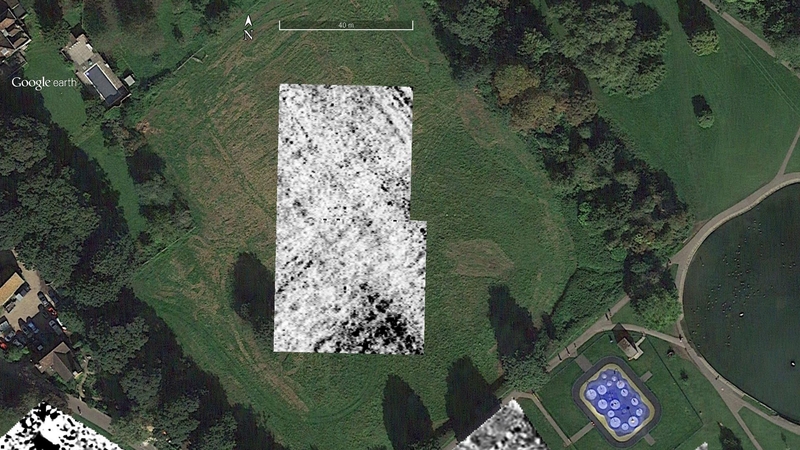 — is that the wheel-ruts which show so clearly on the Google Earth image in the background, also show in the GPR data at this depth. The sixth slice (Fig 5) faintly shows echoes of the drainage. To the north are some black squiggly features. Yes, folks, we have mapped the badger setts! Nothing very archaeological, so far. Fig. 6: GPR survey, time slice 7, from 22.5ns to 25.5ns. In the final slice (Fig. 6), we still have the setts in the north, but we have a very strong linear feature to the south running SW-NE. Comparing this to the proposed line of the road in Fig. 7, we can see that this would appear to be one edge of it. Fig. 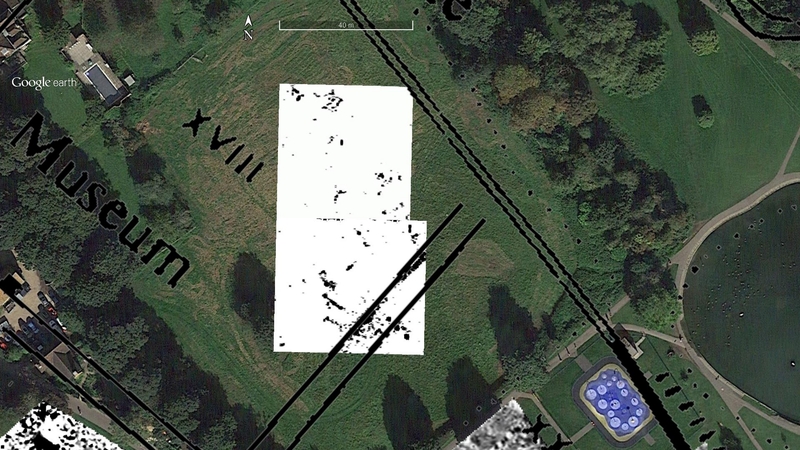 7: GPR survey, time slice 7, from 22.5ns to 25.5ns, with overlain map of Verulamium. Right at the edge of the GPR’s signal depth where the returns are very attenuated, we are starting to see the archaeology. Unfortunately, I cannot yet easily convert the time (22.5ns–25.5ns) into physical depth. It would seem, however, that the archaeology in the lower area may well be at the limit of what we can pick up. If we look at the radargrams, however, we can see a big feature running across our vertical slices and I would guess this is the road surface. Fig. 8: an example radargram showing the possible road. Many thanks to everyone who turned out today and enjoyed the beautiful sunshine. Also, big thanks to Pat for bringing the mag back for us, and Pete and Fiona for arranging for us to be able to survey the Paddock. There probably won’t be a posting tomorrow, but I hope on Weds to catch-up. 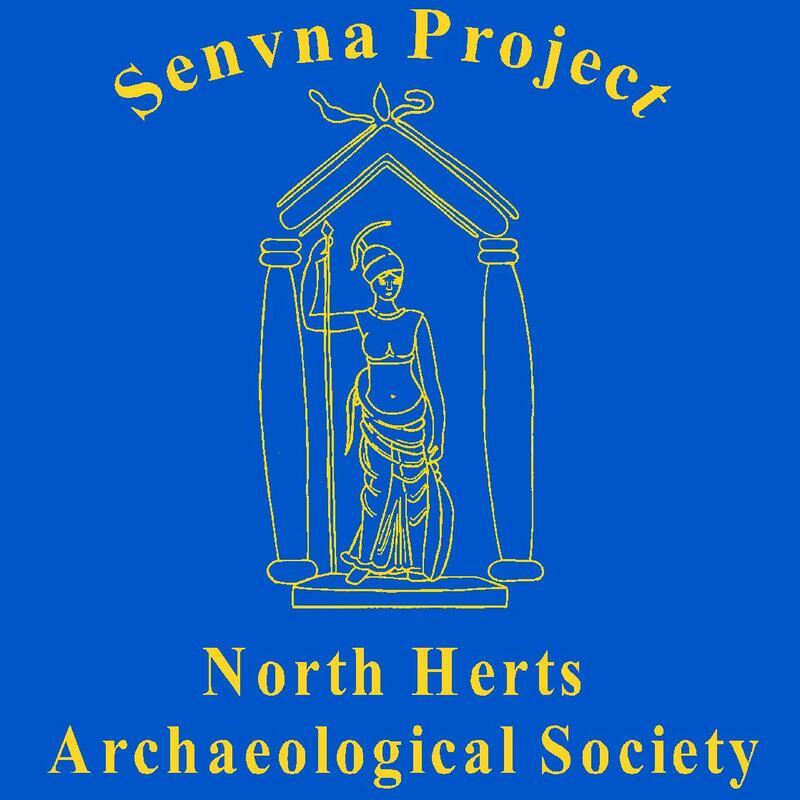 This entry was posted in Verulamium and tagged ahrc, CAGG, GPR, Ground Penetrating Radar, Hertfordshire, magnetometry, Roman, Roman road, Roman town, ucl, Verulamium on March 27, 2017 by hertsgeosurvey.